The parable of the persistent widow was given to encourage believers in Jesus to always pray and not “faint” or lose heart. Continuing in prayer always and not losing heart while doing so is demonstrated as persistent or what I call “knocking tirelessly” prayer. Following this verse, Jesus tells his disciples a parable about a widow who was persistent in her attempt to get what she wanted by “knocking tirelessly” at the door of a judge and she succeeded for the judge opened the door. The petition or request is of great importance if one is willing to spend time and effort to receive a response to one’s satisfaction. There is also tremendous faith or confidence in the source from whom one expects an answer. If he being unjust finally yielded to the widow’s request how much more would God who is a just judge not answer our prayers? Although we may not know when He will do so, if we persist in addressing the subject of our prayer request with Him, reminding Him about it and telling Him we have faith in Him, He will answer it. Someone may pose this question “God is not a God who is deaf or forgets so why persistently “knock” or address the subject again and again with Him until we receive an answer, surely it is unnecessary to do this if one has faith?”. In order to answer the question, let’s pose one first as follows: If addressing the subject of our request again and again with him is vain repetition (because he is not deaf or forgetful !) and therefore a sign of disbelief, why would this parable about the persistent widow be narrated by Jesus at all, even beginning with verse 1. 1)Persistent prayer is also focused prayer. Prayer for a particular thing does not have to be focused or persistent in the manner this aforementioned parable describes, however the parable shows us that persistent prayer is a way of praying which is acceptable to God. 2)It pleases God that His children would pray or converse with Him however many times they desire about what they want or need. He is a Father who cares about His children and wants a continuous relationship which involves communication. A loving Father does not care how often a child asks for something; in fact it enables Father to know how much the child really wants that thing or values it. As only a loving wise Father can, he will grant the request at the right time and in a way which is right for the child. 13 When Jesus heard of it, he departed thence by ship into a desert place apart: and when the people had heard thereof, they followed him on foot out of the cities.14 And Jesus went forth, and saw a great multitude, and was moved with compassion toward them, and he healed their sick.15 And when it was evening, his disciples came to him, saying, This is a desert place, and the time is now past; send the multitude away, that they may go into the villages, and buy themselves victuals. This morning I was led to think about the miracle of multiplication of five loaves and two fishes. I praised the LORD that He is in the business of working miracles for those who accept Jesus Christ as their Lord and Savior. Some people are drawn to Christ because they heard the Gospel preached or because they had a need and this is going on every day. God has His supernatural ways and means of calling us to Himself, so in actual fact we may think we sought Him out, but He planned the scenarios which drew us to Him. Salvation is the greatest miracle that can happen to anyone. We give praise and honour to you, LORD God Almighty! In my personal life I can think of several times God has performed miracles. As we mature in the faith, because we are closer to God, we see things we took for granted or were not aware of spiritually, in a different light. We see God’s hand on everything we do and define them as His miracles. Have you looked for something for such a long time in your home, prayed and then not long after you either remembered where it was or you just found it laying somewhere you thought you had already looked? It has happened to me and even in one case I had this sensation that I was just about to find that vital thing just moments before I actually did as I rampaged through a box packing to move home. Our God performs miracles every day! Some which seem small and some big, they are all miracles from a “big” God! From this account of multiplication of five loaves and two fishes (Matt, 14:13-21), I am also reminded of the God of provision, Jehovah Yireh, always ready to provide for us, our basic needs and more. Another name of God which speaks to us in this regard is El Shaddai, Our Sufficiency or “More than enough God”. After the crowd had eaten and were full there were twelve baskets full of fragments of loaves and fishes left over. Twelve is God’s prophetic number meaning either God’s people, God’s house/dwelling or God’s government; There were twelve apostles, twelve tribes of Israel and 24 (12×2) elders worshipping God before His throne (Rev. 4:10) and the measurement of the square Holy City was “…12,000 furlongs. The length and the breadth and the height of it are equal…” (Rev 21:16). This is a decree of the LORD: He will always give His people provision and there will always be left over or surplus provision (more for us and more through us for others!) available for those who are going to enter the sheepfold at a later date. Will we be among those He can trust to receive and then distribute the leftovers or surplus to those who are in need, thus extending God’s kingdom (government) through our lives? Brethren, they will know us by our fruit and some will make a decision to accept Jesus Christ as Lord and Saviour by how we behave and the kindness we show them. The LORD’s heart is for the poor and needy and Jesus Christ made this clear by explaining that when we feed the poor, give drink to the thirsty and take in those who need shelter, we are doing so as unto him (Matt. 25:34-36). I don’t know what your needs are today brothers and sisters but I encourage you that out of your riches, give to those who lack and out of your poverty, if you consider yourself poor, share with those who lack. This is because our God looks at your heart condition before Him and rewards you accordingly. He has not only promised to provide for you as Jehovah Yireh, but He is also El Shaddai, your sufficiency and more than enough God. He has promised to “do far more abundantly beyond all that we ask or think, according to the power that works within us” (Eph. 3:20 KJV), with this in mind, you know that when you give to those in need you will never lack. Sometimes the LORD will test us even with the little we have as in the case of the widow of Zarephath who God sent Elijah to when he was hungry. I would like to have been there to see her facial expression or reaction when the prophet blessed her with these words: “For thus saith the Lord God of Israel, The barrel of meal shall not waste, neither shall the cruse of oil fail, until the day that the Lord sendeth rain upon the earth” (1 Kings 17:14 KJV). The widow of Zarephath selflessly shared all that she had left for herself and her son with Elijah when he asked her to “and she, and he, and her house, did eat many days. And the barrel of meal wasted not, neither did the cruse of oil fail, according to the word of the Lord, which he spake by Elijah.” (1 King 17:15-16 KJV). As long as we know and obey God’s principle about reaping and sowing or giving and receiving our Christian life will always be marked with not only miraculous provision and surplus but also include other miracles such as healings, deliverances and spiritual blessings. This way we are not only declared righteousness as new covenant believers, but instruments of God to bless multitudes through our giving, testimonies of His glorious works in our lives and ministries in service to Him. We love you and thank you for being our provider and also promising to give us even more than we need. Help us to live in the reality of these truths so that we will reap the rewards of obedience not just for ourselves but for the sake of your kingdom. I ask that you would open our eyes daily to see beyond our own lives, needs and concerns so that our mission in life is as ones broken for the sake of multitudes who are hungry naturally but also hunger spiritually for you and may not even know it. In Jesus’ name Amen. We have to play our part in allowing God’s sovereign will (His manifested Control) to become a reality on earth and it starts with total surrender of our lives to Him as true worshippers available for Him to use us. On a personal level, when we make prayer a lifestyle God is indeed always in control of our lives, because we come in agreement with Him for His purposes in our lives. 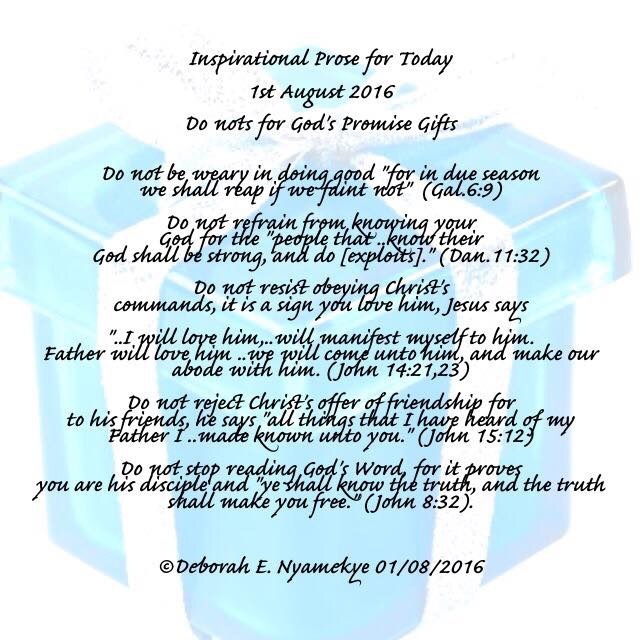 I hope this poetic testimonial ministers to you today and be sure to have a blessed day whatever you are planning to do! 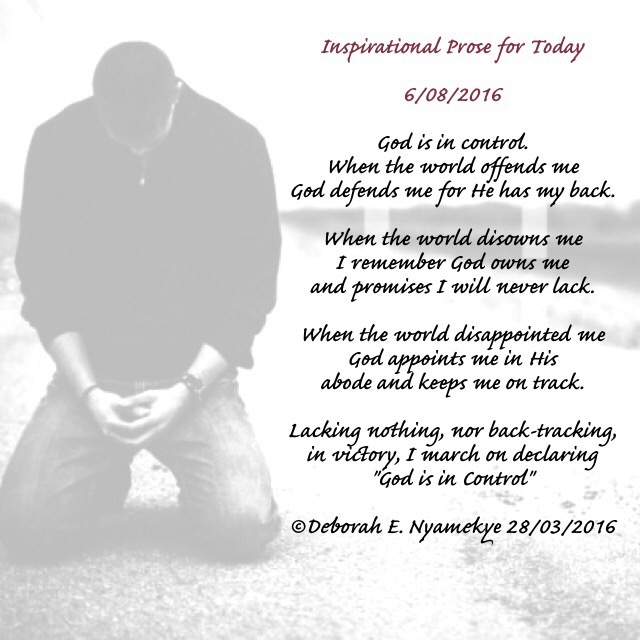 Note: “God is in Control” is a poem included in part 2 of my two Part Books under category “Intimacy with God & Life in His Service” released for sale next week.